As I looked at the Kata Tjuta glimmering on the horizon I felt my body melt into a trance. The enormity of where I was and what I was doing was sinking in. My ability to control my spirit had vanished as I allowed the colors and calmness of the land envelope me. The running pack had dispersed and I was alone. The distant hum of the race helicopter was a brief distraction. The sound of my breathing, and my soft footsteps on the sandy trails send me into a hypnotic trance. Soon I noticed the spinifex on the red earth and it was then that the years that led me to this moment finally hit. Marathons are for mad people. That’s what I’d always thought. And I didn’t fit in that club. But when the social media bug caught hold of me five years ago I was lured by the excitement the Perth HBF Fun Run offered. The hash tag #twitfit became the calling for the group of mad runners I became friends with. Michelle soon became my running mentor. My Yoda. Michelle picked me up and pulled me along at every setback offering support and advice. It became clear early on that to be a runner it wasn’t as simple as putting on a pair of shoes and running. Unless you are Kenyan of course, which is where my online nickname came from. Cheeky Little Kenyan or #CLK. One evening, while indulging my social media habit. A tweet by Michelle piqued my interest. “Sipping champagne, calming the nerves before the race tomorrow.” The race she referred to was the Outback Marathon. The seed was planted. I promised myself that one day I would run this marathon. A crazy thought for someone who’s longest run to-date had been the 14km HBF Fun Run. The Outback Marathon would stretch my abilities beyond my imagination. 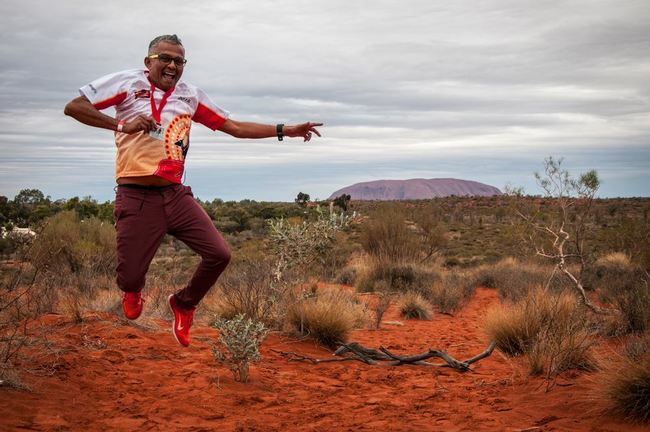 But the desire to run through Australia’s red centre remained strong. For the local Pitjantjatjara people it is a sacred place of ancestral homage. For me, there was a spiritual pull that was almost magical. My journey was riddled with injury after injury. Each time I achieved a greater distance another obstacle would appear in my path. My first half marathon, the Fremantle Half Marathon was one of those obstacles. The experience resulted in immense self doubt. Running a full marathon was out of the question. There was no point putting my body through such pain when that 21km was hard enough. I resolved myself to running half marathons for a while. My mental block was shifting. That’s also when I met another runner through #twitfit. Lee was training to run the Perth Marathon and encouraged me to do it. But the Perth 32km race came up and I thought I’d give it a go. I thought to myself I’ve done a few half marathons by this time. And, if I survived the Perth 32km. What’s another 10km’s? I’d be one step closer to my outback dream. I read everything I could get my hands on about running marathons. From nutrition to how your kidneys can stop working. From how your body switches to survival mode and then sometime’s death. 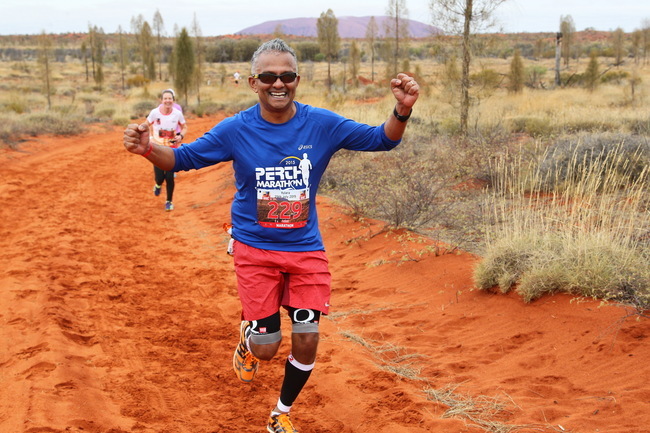 It was all the stuff that made me reconsider ever running the Outback Marathon. Remember, marathons are for crazy people. But I was inching closer to being a member of the crazy club. My first full The Perth Marathon gave me such a high that I came out of it thinking I needed to do another one. I immediately signed up for the Perth City to Surf Marathon. It took everything I had and spat it out, my marathon spirit broken and my ego in tatters. In my mind the outback was now out of the question. My online running community grew in size and #Flash was my new name! I decided to have one last go at this marathon caper by signing up for the Bunbury 3 Waters Marathon. Bonus I would get to catch up with Lee Maree (LMG) who by now looked up to me for training tips. It wasn’t my best finish, LMG fared way better. I then ended up running Perth to fix my bruised ego and I got a PB! This meant just one thing it was time to take on the nemesis City to Surf again. I was a nervous wreck before the race and even forgot my Garmin on the day. I almost equalled my Perth time and actually enjoyed that run. Revenge was sweet. I was now one of those mad people who run marathons and always talked about them. I became a runner who wasn’t training for any particular race. Running was just something I did. 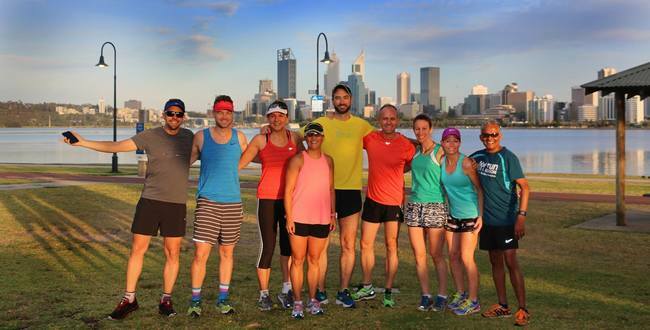 Running became a social activity and my little community in Perth became the #pigrunners. People would ask me what I was training for and I would reply “Life.” Through twitter another friend Gillian introduced me to BT running club. Simon the spiritual leader of BT joined me up with Kelly. She became my Saturday morning running partner. She was the dose of maturity I needed to run long distances. She helped foster my self-belief, resist the urge to surge, and above all run run run. The Outback reared it’s head and was now on the agenda for the following year. I decided to ask my work crew at Eduka to come with me and also my online running community friends . Only two of them took me up on the challenge, Ronan and Eli. Having recently moved from France to Australia, running through the Red Centre was appealing. From my running community. My good friend Steph put her hand up. The seed had not just sprouted but the roots were also taking hold. As soon as the places for 2015 opened we jumped on and made a booking. I was holding out hope that Vanessa would take the plunge later on so I booked the Emu Apartments that slept six. My dream of running the Outback Marathon was another step closer. An epic adventure was imminent. My training schedule was set and I planned to run the Perth and City to Surf Marathons. I then fell victim to the runners worst nightmare – injury. I only managed a few small runs and did not take part in any marathons. Luckily for me Vanessa was training for the Disney marathon in January and that was just the tonic I needed. I helped Vanessa train for the Disney Marathon in Orlando. Those slow long runs were what I needed to get some confidence back. The year I planned to run the Outback finally arrived. My plan for 2015 was to just run that race. Kelly suggested I do the Bunbury Marathon as a training run. As I was not only dealing with a post injury comeback but those mental demons had been instilled again. The Bunbury marathon turned out to be the most enjoyable marathon I had run. It was the also the first marathon that I ran without any prep. So, I didn’t take too much convincing to sign up for the Perth Marathon in June. The proved to be a great decision. I ended up with another PB and a huge ego. We eventually convinced Vanessa to join our adventure. Her parents and husband flew in for extra support. Bruce would run the half marathon and Jeremy would do the full. Each marathon takes a little bit out of you and each run is chipping away at you. Given the proximity of the Outback (end July) I cloaked myself in bubble wrap and hardly ran. But my fitness took a hit. There’s no direct flight from Perth to Uluru. We flew into Alice Springs and spent the first night there. Ronan and Eli relaxed and Vanessa and I ran on and around the river bed. Running there was special and we knew we were in for a huge treat in two days. That evening we celebrated my 23rd wedding anniversary and I was sad Deepa was not there. I drank a few wines too many and should have stuck to water! Steph almost didn’t make the journey from Sydney due to a bad bout of gastro (that turned out to be her gall bladder). We met at the race briefing. The race briefing included an introduction to every country that had a representative running. We were told what to do and what not to do as we were running on traditional land. Traveling Fit, the organisation that owns and runs this event had built a UN of runners. The camaraderie of all those at the Ayers rock resort was incredible. I ate the biggest feast I had ever eaten the night before a marathon. There was buffet dinner with eat as much as you want and $10 champagne. Once we had dinner it was off to bed. Vanessa and Jeremy took one room, Eli opted for the lounge near the kitchen and Ronan and I shared our room. Ronan could not sleep and watched movies on his surface for hours. It was a struggle to fall asleep. No sooner had I snoozed off I heard Vanessa up and about. Making it to the breakfast table following a sleepless night was hard. It made me question my moment of wisdom in booking an apartment that sleeps six. Next time one bedroom will do. I passed Ronan at 32 km he was struggling. I stood next to him for a bit and asked if he wanted to run together. Ronan had done no training for this marathon and was just going to wing it – I was impressed he had got this far. I met two ladies from country WA and had a long chat about the running and was still overtaking people. I had overcome the wall. But sometimes in the run there is a bigger wall ahead and when one of the markers for 39km did not appear when I expected it. This was the last straw I started walking! The two ladies caught up with me and coaxed me to carry on. I did. As I got across towards the finish line, Vanessa high fived me, I was so happy to see her. I knew she had got her PB and broken 4hrs! For me no records were broken, but yet some deep friendships were formed. Those friendships will remain for a lifetime. 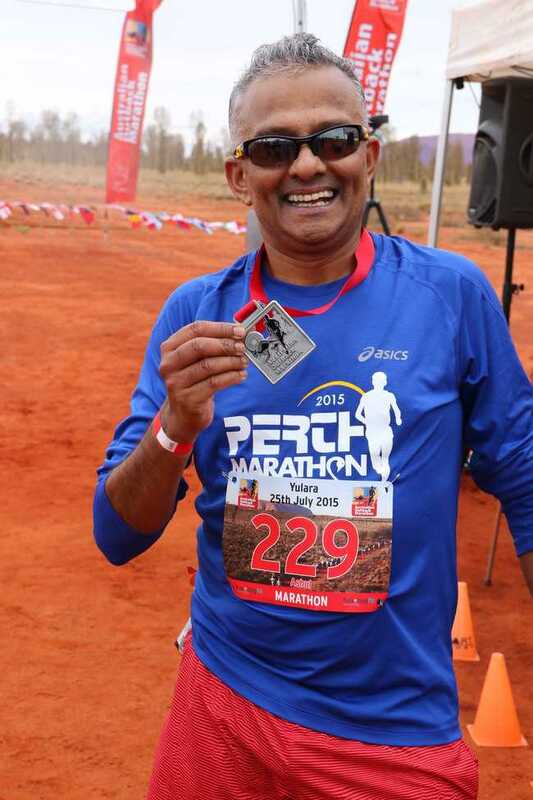 The Outback Marathon was not just about dreams coming true. For me it was also having the self determination to overcome obstacles no matter how big or small. I look back at the experience as my own dreamtime as much as that of the traditional custodians of the land.